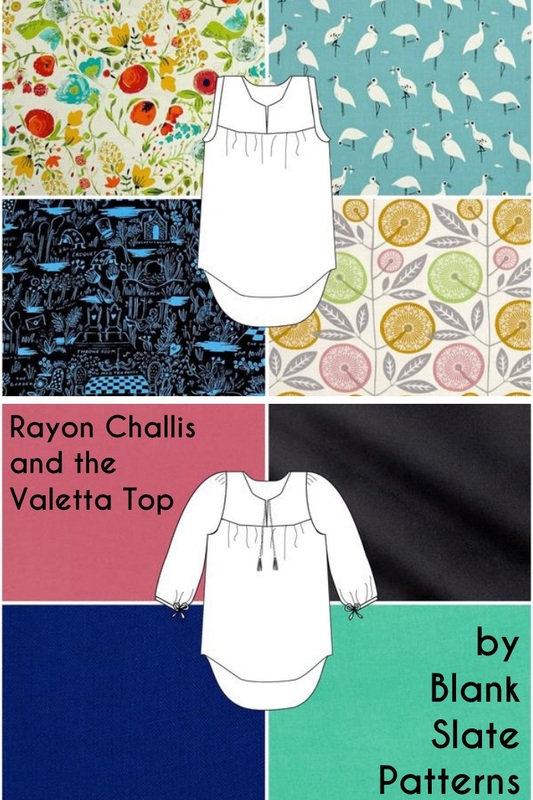 Rayon challis (pronounced shall–ee) is an incredibly versatile fabric that has become much more widely available in recent years, in an impressive array of prints! It’s man-made from cellulose, which means that unlike fabrics manufactured from petroleum derivatives (polyesters, etc), it breathes like other natural fibers. This lightweight, soft substrate is defined by its great drape. It flows nicely over curves without clinging. Solid rayon challis makes a luxurious staple – great for pairing with prints, wearing under your favorite cardi, and accessorizing as much or as little as you like. Of course we all love a good print! Whether you lean whimsical, floral geometric, or any which way with your prints, there’s a rayon challis to cover you. And lastly, it’s the semi-solids. Or is it non-prints? Whatever you call them, these textured-looking designs are really versatile and will rock for your Valetta! And they’re perfect for print mixing (tips on that here). The Valetta Peasant Top can be purchased here when it’s released!